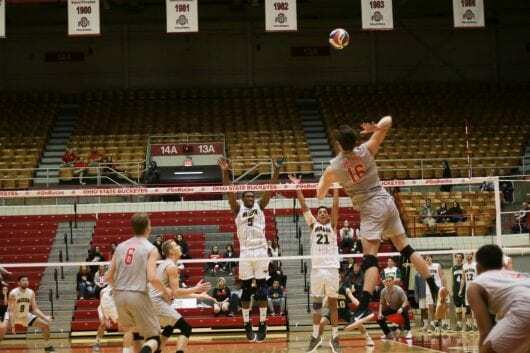 The Ohio State men’s volleyball team took on McKendree on Sunday, the second of a two-match home series, hoping to build on its Friday victory against the Bearcats. But the Buckeyes came up short, falling in five sets, 25-23, 19-25, 22-25, 25-22 and 10-15. The Buckeyes (6-12, 2-6 MIVA) struggled to keep the ball in play for much of the night, totalling 47 combined errors to McKendree’s 36. Of the five sets, only the first and the third had lead changes, while the final two sets saw just a single tied score. Two aces gave McKendree an early 3-1 advantage in the fifth set, but kills by freshman outside hitter Sean Ryan and sophomore outside hitter Jake Hanes brought the Buckeyes within one, 4-3. The Bearcats responded with a resounding five-point run, featuring an ace and three Ohio State errors, giving McKendree a 9-3 advantage. The Buckeyes used an error and an ace by Hanes to bring the score to 9-5, but the Bearcats wouldn’t relinquish their lead, killing the next two points and adding another ace en-route to a 15-10 set victory and taking the match, 3-2. The Bearcats totalled seven aces on the night, four of which came in the final set. Head coach Pete Hanson said errors kept the Buckeyes from challenging McKendree. Not taking errors into account, the Buckeyes performed on par offensively with their performance on Friday, killing 58 balls and serving up six aces. Hanes led the Buckeyes with 22 kills and 10 digs, adding an ace and four block assists. The Bearcats were led by junior opposite hitter Zach Schnittker, who racked up 14 kills, two aces, five digs and four block assists. Ohio State opened the fourth set with an ace by junior setter Andrew Hillman as well as a kill and an ace by Ryan for a 5-1 advantage. Ohio State’s lead ballooned to as many as seven, but a late push by the Bearcats featuring back-to-back kills by sophomore outside hitter Patrick Ross cut the lead to 23-21. Attempting to force a fifth set, the Buckeyes would not be denied, using a kill by redshirt senior Blake Leeson and a block by Hillman and sophomore middle blocker Austin Gerwig to put the set away, 25-22. Hillman finished with 26 assists, two kills and two aces. Hillman spent the beginning of this season out with an injury he sustained in December during training, and he said he felt comfortable in his first match of the season. Ohio State jumps back into nonconference play against No. 6 UCLA at 8 p.m. on Friday and USC at 11 p.m. on Saturday in Los Angeles.